Next week I’ll be running a half-day workshop at Translation World 2009 here in Toronto. It should be an interesting session, we’re going to work with the attendees to start to frame out a common language for specifying and mapping out integrations in the translation industry. Over the past few years, the translation industry has seen a huge evolution in the tools, technologies and standards available to help streamline the translation process. Clients, technology providers and language service providers alike are dealing with an ever-changing landscape of service and technology offerings claiming to help make the translation process more efficient. While many organizations are beginning to embrace this shift, the industry still lacks a common language to describe and specify how the various components relate to each other to create a seamless process. This workshop aims to begin filling that gap. 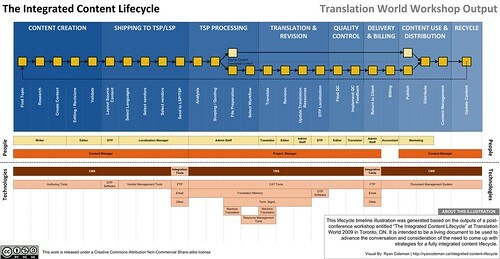 During this unique, interactive session, attendees will work together through a facilitated, visual process to define the components, standards and considerations for creating integrated, efficient, translation lifecycles. Further, we’ll look at how the various components and workflows work together. This workshop is ideal for anyone who has involvement in, or direct responsibility for the ongoing improvement of processes within their organization, whether they are on the client or vendor side. Attendees will play an active role in shaping this common language and will leave the workshop with a new tool set for envisioning and planning integrated lifecycle solutions. If this is up your alley, and you want to be part of shaping this critical tool set, I hope you can join us next Wednesday! Registration is $235 for the halfday session. All of the registration details and forms can be found here.